Requiescat in pace, bard of darkness and light. Ray Bradbury has died, at the age of 91. He was a giant of literature. Instapundit singles out Dandelion Wine. Let me add Something Wicked This Way Comes and The Halloween Tree. And just about everything else he ever wrote. 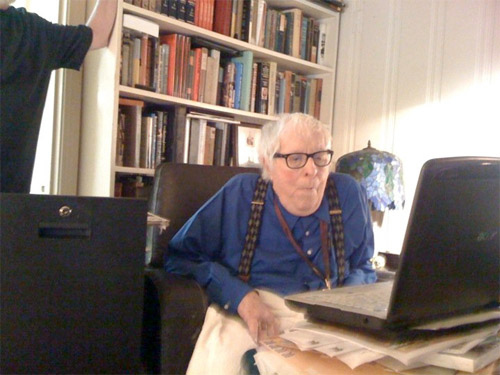 I thought this site had praised Bradbury several times. Nope. Only in passing, though in a post that owes all to him. And again there are tears in my eyes as I write. Will add a NSFW link later, when not…you know, at work. If you can’t wait it’s probably on YouTube, search F*** Me, Ray Bradbury. Now that’s a fan! There’s also a vid of Mr. Bradbury watching that vid, somewhere. Goodbye, sir. Tell Roger Zelasny that we still miss his darkness and light, as well. UPDATE–Though disputing Ms. Bloom’s claim that he’s the greatest sci-fi writer in history (he was a fantasy writer above all) her enthusiasm is not in doubt. 3 Responses to Requiescat in pace, bard of darkness and light. Never read anything from him. I saw the Fahrenheit movie once, and I was less then unimpressed. Maybe because I was still a teen and pretty much a Trek War-er (aka Star Trek and Star Wars), until I got into Babylon 5, which did away with all the naive nonsense Star Trek threw around and showed a future not much different from today. And these days I prefer a totally different sci-fi approach. Well, if you can adjust for different eras, I’d say you’re more an E.E. “Doc” Smith kind of guy. He went cosmic about 50 years before anyone else. Though your intro is a most suitable descendent of Smith’s over-the-top scale of action. Nothing over the top there good sir.